This edition of Futuris looks at the new, more intelligent breed of remote-operated vehicles (ROVs) and how they will benefit us. If an undersea mission is too deep or risky for human divers, researchers can send down an ROV, as we discover in the French city of Marseille. At the time of our visit, the Janus research vessel was about to leave Marseilles port for a day at sea. It carries a piece of technology often used to observe or manipulate items on the sea floor: a pressure-resistant robotic platform tethered to the ship by a very long cable. “Humans can’t go beyond a certain depth,” explained Peter Weiss, robotics and automation engineer, Comex. It is extremely rare that divers go deeper than 100 meters deep (which is already very demanding). With particular equipment (atmospheric diving suit) it is possible to go up to 700m deep, but their use is still very experimental, and remains the exception rather than a daily routine. 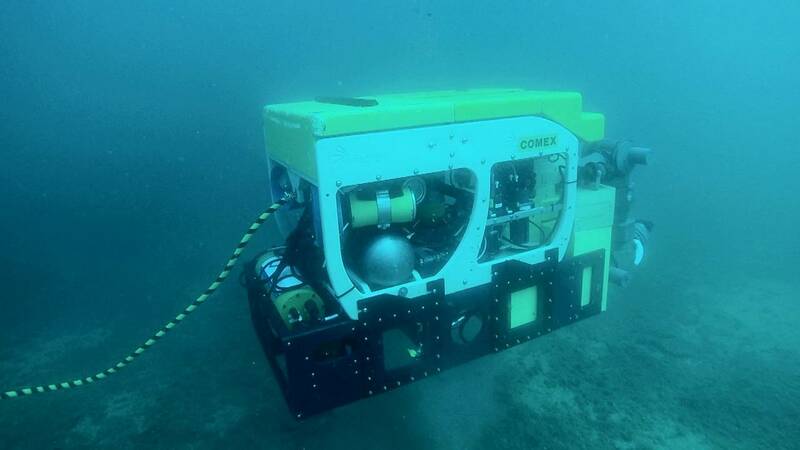 This vessel’s ROV has two cameras which, just like human eyes, provide stereoscopic vision, and with advanced ‘arms’ — the manipulators have three ‘fingers’, so more dexterous than typical two-fingered ROVs. “There is some room for progress in terms of dexterity when manipulating objects,” explained Jeremi Gancet,” DexROV project coordinator and technologies, applications & research division manager at Space Applications Services. Until then, all ROVs need to be controlled from the ship. Moving the control onto land would be safer and more cost-effective, as smaller vessels could be used. For the test, a ship in the Mediterranean Sea is linked via a satellite to the control centre in Belgium. Some 1,000 km away, the operators work in a virtual reality simulation. Their commands are relayed back to the ROV. There is a communication delay. So the ROV has to be autonomous enough to operate safely with no real-time control. It also needs intelligence to interpret what’s happening in the virtual world, and to act accordingly in the sea. ”We have separated what the robot does from what the control centre does,” Javier Martínez González, Researcher in virtual reality, Space Applications Services, told Euronews. To make robotic arms more dexterous, engineers in this European research project are using an exoskeleton system. It provides the operator with force feedback, allowing to feel the weight and resistance of the objects manipulated in virtual reality. ”We’ll control this 3D character in virtual reality,” said Pierre Letier, Robotics engineer, Space Applications Services. This technology can help to control autonomous vehicles safely and accurately — not just in depths of the ocean, but also on land, or wherever robotic dexterity could be used. “You can imagine this same kind of technology used on a mobile platform on the ground, with manipulator arms,” said Jeremi Gancet. The researchers are testing components of their advanced ROV system, heading to a advanced trial 1,300 meters deep in the Mediterranean Sea.